This post is the second of a serie about the FusionForge Taskboard Plugin which comes with the new 6.0 version. You can find a small preview about this plugin features here. The idea is to use one tracker to store the artifacts and another one for the User Stories and set specific extrafields to link artifacts to User Stories. Once you create the artifacts tracker, you need to add two extrafields for this tracker. First one dedicated to “Status” must have as field alias “resolution” and be a status type. This extrafield will be used to link each column of the taskboard to specific resolution “Status”. The “resolution” status values are meaningful. Remember that your task board will link this resolution status to a phase of work. You do not need to set the values of this extrafield to the different names of the columns you want to create in your task board. Second one “Relation between artifacts” is to link artifacts to the User Story. The field alias and name is free but remember your users need to know what is the purpose of this field. In our example the field name and alias are “user story”. This tracker will be dedicated to store all user stories. For this tracker, you need to create only one mandatory extrafields. Still a second one is good to setup. First mandatory extrafield is a “Target Release” select box type extrafield. The field alias MUST be “release”. It will be use to filter the Taskboard per release and display only User Stories that need to be done during the release. Second optional extrafield is again a “Resolution” field and be a status field to be able to work at user story level. Now you are ready to setup your Taskboard Plugin. Next post will show you how to use your new trackers. In the forthcoming FusionForge 6.0 release, a new plugin is landing as announced here the Taskboard plugin. This small post aims to answer to some basic questions. In a next post, we will try to help you to setup this plugin. What kind of features can I expect from this plugin? 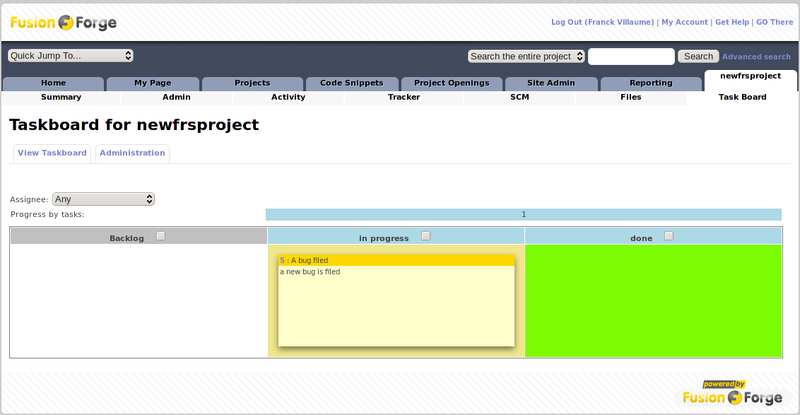 Taskboard plugin implements the Scrum Task Board. That means you can create your User Stories using one tracker, create your artifacts linked to user stories using a second tracker and display it like this screenshot. The backend used is the standard tracker module. You can continue to use your trackers in parallel. You just need some setup before using TaskBoard plugin (meaning: Taskboard configuration itself plus some mandatory tracker extrafields). This setup will be presented in a next post. Can I filter per user story, release or assignee? Currently, you can only filter per release or per assignee. You cannot just select one user story. If you need this feature, do not hesitate to request it here. You can also tick per column to wrap the user story, that way you will display much more user stories on one screen if you have a lot of artifacts per user story. Is it a drag & drop board? Yes. You select the card and you can move it the the dedicated column. Each column is linked to a specific resolution status on the drop action. The update is automatic. When I move a card, will it be assign to me? By default, the behaviour is not to assign the card to the updater. But configuration can allow it. Thank you for your feedback. There you can open a bug. 2 major news this month. We hope you like as much as we do these two announcements. Yes! Finally, 6.0 branch is open. Time for stabilization, testing. You can grab the code here. Do not hesitate to open bugs. We need your feedback, especially on the migration part. Since the SCM integration has been rewritten, migration path might be tricky. Use the forum for help. The docman webdav read/write access need polishing. Feedback also welcome on this topic. Taskboard plugin source for master is available here. More documentation to come once the plugin is ready to use. The turn of the year is now behind us, maybe it’s time to do a small FusionForge retrospective. 2014 has been a very active year for FusionForge, lot of activities, lot of news. Facts: about 3190 commits, 14 commiters, over 150 artifacts closed and 120 artifacts open, one major & three maintenance releases. Here is a small focus on three main topics. You need more detail? Read all the previous blog entries. Just after the April Fools’ day, FusionForge community released the 5.3 version. Two maintenance releases has been made public since then, fixing lots of bugs and including small enhancements. The 5.3 releases have been downloaded 1200 times. Quite a good statistic! 2014 is also the year where FusionForge community grew. Beuc joins us. Inria sponsored him with a full time job. And by the end of the 2014 year, vipylypiv started to publish his code in FusionForge main community website. After the commiters’ meeting in Paris, some major features has been announced and popped up in the FusionForge git repository: document webdav access, FRS code rewrite, responsiveness, SCM ssh + dav concurrent access, Grand Unified Makefile aka GUM and many other rewrites, enhancements, bugfixes. Obviously 6.0 is in our mind. We need first to branch the 6.0 in our git repository. You can find the included features here. The branching should be done this January. Then RC and then the GA. If everything goes smooth: targeted date is April Fools’ of course. Want to join? Do not hesitate FusionForge is the real opensource Forge! We need you! This month has been a low contribution rate to FusionForge. TrivialDev Core Team has been focus on fixing old bugs, cleaning docman code & continue the FRS rewrite / enhancement. Here is the list of artefacts closed by TrivialDev Core Team. Bugs fixed in the 5.3 branch. New features available in the master branch. These widgets will help you to display easily on your homepage (user or project) the commits published on the main repository of the project or the commits you published on the projects where you have at least scm read access. The “My latest Commits” supports preferences. You can set the number of commits you want to show per project. Default value is 5. Currently both widgets only work with subversion or git scm plugins. Mercurial support should land soon. This artefact lists all the commits on this topic. This month, “renaming” file or folder is now available. Since most of the webdav commands are now implemented, it’s time for testing. Do not hesitate to test and report. How to use it? We assume you have a FusionForge git master install. You need to install the pear module “HTTP_WebDAV_Server”. It’s usually available thru pear or packaged in your favorite distribution. Once installed, you need to enable webdav in your FusionForge installation. Set the flag “use_webdav” to “yes” in your config.ini files. Now projects using docman module will be able to enable webdav access in the administration panel of the docman module. One limitation: there is no anonymous access yet. You need a valid account with at least docman read access. #740: wrong status displayed when no job is available. From now on, the Monthly Report will be the “Monthly FusionForge Report”. That makes more sense since this report is dedicated to TrivialDev work on FusionForge. So what’s new? Second maintenance release of the 5.3 serie, this release is also a security release. If you use previous version of FusionForge, please update or at least apply the security fix available here. “allepoch”: rebuild from epoch. Use it only if you have imported older SCM repository than the registration date. “group_id”: can be use to run the cronjob against one project only. Details of the 5.3.2 release is here. Some enhancements landed in the SCM Mercurial Plugin. the commits activity is now displayed in the “Activity” tab. The link points to the commit detail. the “Repository History” block is now available. FusionForge can use multiple Authentication plugins following PAM design (sufficient, requires). AuthLDAP plugin is used to plug any LDAP server to FusionForge. ActiveDirectory is now supported. We’ll see if we can be on schedule! During this working vacation, TrivialDev Core Team focus their effort on multiple elements. TrivialDev Core Team starts a mediawiki page to gather ideas & wishes about FRS. Do not hesitate to contribute. Once the FRS code reorganised, new features landed these last months. FRS role setting has been reimplemented to offer more precise roles per package. You can now delegate admin role per package or even delegate only releases administration in a package. A migration script is provided to help you to update your database. Still the “public” flag of a package is unclear and need to be polish. Mass action has started to appear too. You can now select multiple packages and delete them at once. As Tracker and Docman previously, Forum module now stores the attachments on the filesystem. Few bugfixes, some really annoying such as “custom field status” initialisation data was missing [#712]. Remember that bugfixes lands into maintenance Branch. New feature lands into master Branch. About new feature, you can now use multi-select extrafield to build your roadmap, because sometime a bug belongs to multiple releases. You can always find FusionForge roadmap with all new bugfixes, features or accepted patches here. TrivialDev Core Team focus their effort on the FRS module. FusionForge provide a simple way to publish deliverables of a project. Deliverables (binaries, sources, documents, …) are organized by package. A package can have multiple versions. Each package can be monitored by user. The FRS system is a very handy place for publishing new versions of your project. Still, up to the 5.3 branch, the FRS code was old, not very easy to maintain. Adding new features to FRS require a clean code reorganisation first. Well, it’s done. Now the code organisation follows the same pattern than the docman module. The FRS “monitored package” user widget is available and the FRS link is displayed in the “Public Area” widget, just as any other tools. And now ? A wiki page is available about FRS rewrite proposition. Next step is to rewrite the permission settings, the same way the tracker is doing it. Meaning, permissions per package. Feel free to open feature request about FRS here. As announce here, FusionForge 5.3.1 has been published last June 6th. It’s a cumulative bugfix release. At least 37 bugs are fixed. Please update. This month, one of our core team member lost his computer. Hopefuly, warranty & repair worked. No data loss. Excepting this hiccup, TrivialDev core team focus there effort on 2 topics. You can get all details about these bugs here. 5.3.1 will be the first maintenance release of the 5.3. We will try to publish a maintenance release every 2 months from now on. Docman webdav write access start to land in the master branch. You can follow details about this work here. Do not hesitate to test and report feedback. mkcol, delete, put, move commands should work. lock is under heavy work since it’s required a lot of rewrite even in the PHP standard GUI. Docman move mass action is now available. You can now select multiple documents and move them to targeted folder. No more move file by file. FusionForge has a simple feedback message system. 3 global PHP vars are used. Until now, the system read the feedback, error, warning messages from the parameters set in the URL. Now the messages are stored in a cookie, since these messages are user-oriented. No more &feedback= or &error_msg= in the URL.